The bond between a mother and son is like no other, and these sweet baby boy quotes express just how special that bond is. Finding the perfect baby quotes to represent you and your son is important in capturing this time of your life. Becoming a new mom to a beautiful baby boy is a life-altering experience, and these baby boy inspirational quotes will say “I love my baby boy” in the perfect way. 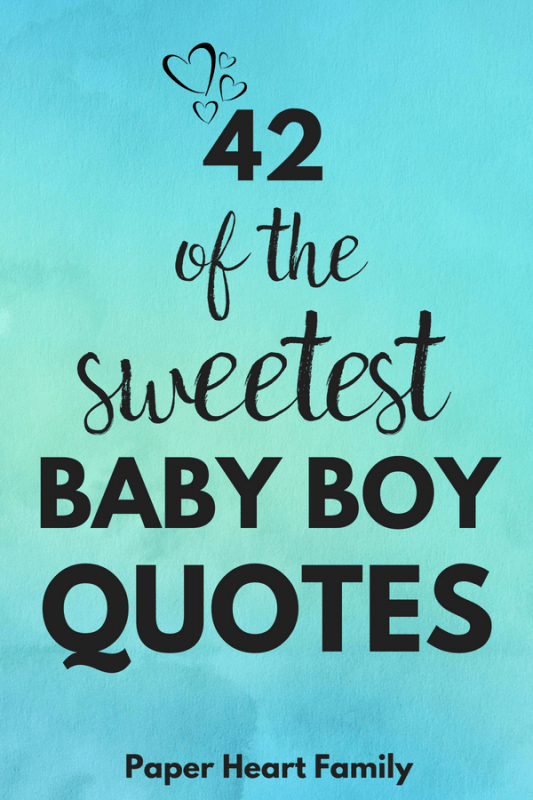 This list contains some of the sweetest baby quotes out there. These quotes for baby boy would be perfect baby wall quotes for the nursery, for a scrapbook or baby book or it’s a boy quotes, perfect for a card to a new mom. So what are you looking for? Quotes about loving your baby boy, newborn baby quotes or cute baby boy sayings. You can find all of them here! Or this one filled with baby quotes for all stages of your baby’s life. Something tells me I am going to love him forever. His little hands stole my heart, and his little feet ran away with it. Son, you’ll outgrow my lap but never my heart. You are loved for the boy you are, the man you will become and the son you will always be. For this little boy we have prayed. No joy on Earth brings greater pleasure than a little boy to love and treasure. A baby boy arrives, and just like that, everything changes. The world gets bigger, hearts grow fuller, and life means more because he’s in it. A little miracle sent from above, a baby boy to cuddle and love. Sons may grow into men and grow out of their toys, but in the hearts of their mothers they are still their little boys. You’ll be his first kiss, his first love, his first friend, you are his momma, and he is your whole world. He is your little boy. Hold him a little longer, rock him a little more. Read him another story, you’ve already read him four. Let him sleep on your shoulder, rejoice in his happy smile, he is only a little boy for such a little while. Such a big miracle in such a little boy. So much joy in this little boy. A boy is truth with dirt on its face,beauty with a cut on its finger, wisdom with bubble gum in its hair, and the hope of the future with a frog in its pocket. 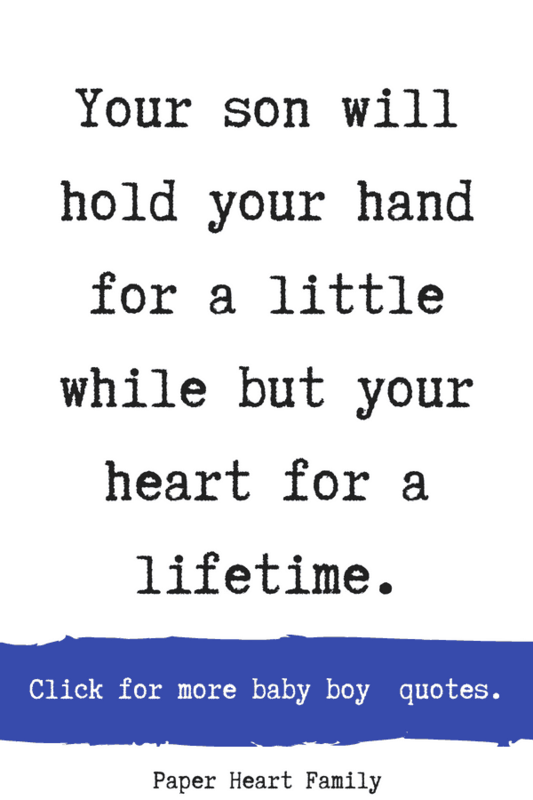 Your son will hold your hand for a little while but your heart for a lifetime. Little hands and little feet, little toothless grins so sweet, little eyes that shine so bright, little arms to hug you tight, everything’s little except your joy when you have a new baby boy. How wonderful life is, now you’re in the world. I don’t know who you’ll be, but I know you’ll be my everything. My wish for you: To splash in muddy puddles, to run through green fields, to feel the sun on your skin, to make special friends, to find the end of the rainbow, to sleep under the stars, to spread our wings and fly like a bird. Yes, I gave you life… but really, you gave me mine. I am your mother, you are my child. I am your quiet place, you are my wild. I am your calm face, you are my giggle. I am your wait, you are my wiggle. I am your dinner, you are my chocolate cake. I am your bedtime, you are my wide awake. I am your lullaby, you are my peek-a-boo. I am your goodnight kiss, you are my I love you. And then my soul saw you and it kind of went “Oh, there you are. I’ve been looking for you”. I loved you from the very start. You stole my breath, embraced my heart. Our life together has just begun. You’re part of me, my little one. May you always know my little one you were wished for, longed for, prayed for and wanted. I love you. Precious one, so small, so sweet. Dancing in on angel’s feet. Straight from heaven’s brightest star. What a miracle you truly are. A wee bit of heaven drifted down from above – a handful of happiness, a heart full of love. The mystery of life, so sacred and sweet. The giver of joy so deep and complete. Precious and priceless, so lovable, too. The world’s sweetest miracle, baby, is you. From the moment they placed you into my arms you snuggled right into my heart. Mightier than the waves of the sea is this love for you. I carried you every second of your life and I will love you every second of mine. Let them be little cause they’re only that way for a while. Give them hope, give them praise, give them hope everyday. Let them cry, let them giggle, let them sleep in the middle, oh just let them be little. What are your favorite baby boy quotes?